With three months to go, we are delighted to announce that we have over 120 people booked for the conference. So without further ado, please find the latest information on the schedule of speakers, day tickets (and discount code) and lightning talks. There have been a number of enquiries about day tickets for the conference, and we are pleased to say these were launched today. It's £140 for a day ticket for either Saturday or Sunday. If you're keen to get your ticket, we have set up the discount code earlybird to get you £20 off your ticket (available up to 30th September). For the first time, we are launching our lightning talk series which we will be running over lunchtime each day. 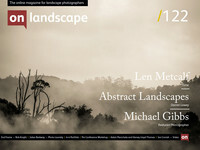 Celebrating the craft and community of landscape photography is one of our core values. Getting speakers from our subscribers to talk about their projects and ideas is something that we're remarkedly proud of. Up until recently, we had two choices of filter transition, soft and hard, and you picked the one you wanted based on whether you used wide angle lenses. Most of the time this worked, but On Landscape and Lee worked together to produce Soft, Medium, Hard and Very Hard transitions for their filters. The talk looks at the relationship between the different transitions and camera/lens combinations with the aim of producing a predictable effect and to help people choose the appropriate filters. Karen will be talking about getting a photographic project from a germ of an idea to an exhibition. The American West is a photographer’s mecca, especially Utah and Arizona with their canyons both Grand and Intimate. A land of iconic vistas, but a risk of photographic cliché. So how do you search for your own point of view? Is it possible to develop a vision as well as technique while on a landscape workshop? Here’s what I learned when I swapped being a landscape workshop attendee for leading the workshop myself. Using pinhole cameras and film I explore humanity's relationship with the land and how it has used the land. Humanity has always used the land to his own ends and he has left evidence of that across the millennia from the subtle to wholesale reforming of the land. Colin will be using his work from Holme Fell, Thirlmere and Delamere Forest to talk about how the landscape reveals the narrative of its history and regeneration. He will talk about how to create photographs that embrace imperfection and reflect the sense of place and not just a location. A year of images. Some seen and some unseen, and stories of how those images came to be. Moments of unparalleled grandeur interspersed with quieter reflection. A personal love affair, with this most special of National Parks. In between the extremes of sharp detail and blur, photographing water offers a wide range of possibilities; a palette to suit each mood, the possibility of a painter’s touch. Rather than focus on incident or motion, I increasingly look at the surface of the river as a canvas on which I’m making marks and finding new truths. An introduction to the capture and creation of time-lapse films in remote areas. Alex will discuss the unique challenges he has experienced whilst shooting time-lapse films in the Drakensberg and Greenland. Richard explains how his photography has evolved to a point where his images are always about where he is standing rather than the horizon thanks to using Large Format cameras. He also demonstrates how reading from the front down helps to build strong composition often making light a secondary consideration when taking a photograph.